Last week – along with J K Rowling – I got my publisher to ask for a pirated copy of one of my books to be removed from www.scribd.com. Scribd is a file-sharing site to which people can upload texts, including books, that they want to ‘share’ with others. 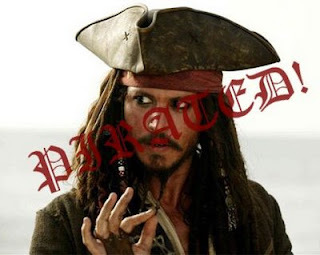 Scribd make clear that it is not their aim to offer pirated content, and say they will take down pirate copies quickly when notified (in keeping with the US Digital Millennium Copyright Act) – but mine is still there six days later. Whatever scribd may intend, pirated copies of books in copyright do appear on their site and unless authors or their publishers notice them, they remain there. My book had been there for nearly a year and downloaded 360 times. The book was a pdf, all its full-colour pictures still in place and with the text selectable - which suggests it wasn’t just scanned in. It claims to have a ‘non-commercial attribution’ creative commons license, which means people can use it for non-commercial purposes as long as they say where it came from! Children’s fiction is unlikely to be top of the pirates’ list - younger children are not up to scanning and file sharing, and parents won’t bother. But by the age of 12 or so, readers are well able to do it and the more popular children’s books are already being pirated. A bit of poking around in the pirates’ den unearthed Celia Rees’s Sorceress in Italian, some of the Series of Unfortunate Events in Spanish, Northern Lights in Hungarian… and even The Very Hungry Caterpillar in various forms. It’s easy to jump to the conclusion that every download is a lost sale and this will cost writers and publishers a fortune, perhaps our livelihoods. But it’s impossible to tell how many people downloading pirate e-copies would otherwise buy a paper book, and that’s the figure that really represents lost sales. Many would never read the book if they could only get it by paying for it. It’s not clear yet whether piracy will cost more sales than borrowing books from friends or libraries, or looking through them in bookshops. Not everyone wants to read a novel on screen and in some cases Scribd may even boost sales, if the reader gives up and orders the book from Amazon instead. But as people become more willing to read books on screen (computer, phone, whatever), the licit and illicit will come closer together. The longer publishers resist producing their own e-books, the more likely a book is to be pirated; not wanting to ‘do’ e-books may not be an option. The transition period, as a new model of reading, paying for and distributing books emerges, is likely to be a rocky ride for publishers and writers. Excuse me, I have to go and re-decorate my garret ready for an episode of starving-and-freezing therein as the icy wind of digital piracy reduces our patch to a desolate waste. Just as computers have made so many good things better and easier, it's probably unavoidable that they make bad things happen at at least the same speed. I suspect you are right in that many who download/copy stuff would not have paid for it anyway. The garret sounds lovely! Can we see a photo when you're done? 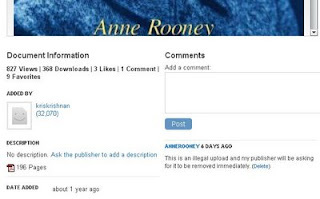 We received an email about an Anne Rooney book last week from Tom Oakes. I contacted him immediately and asked him to submit a valid DMCA affidavit, but I've not heard back from him. A copy of a legally valid DMCA affidavit is available at http://support.scribd.com/forums/33563/entries/22980. Anne - so interesting and topical. I have a Facebook group called Fair Reading, which is about issues such as this. Making the public (and authors) aware of the consequences is really important. Know him, know his views, went to his wedding reception :-) But thank you, Lee. Wedding reception, eh? 'Fraid I don't travel in such illustrious circles - not even online!